The specialists had just 15 hours to carry out a project dubbed CT Mummy Operation: visitors to the National Archaeology Museum were not meant to notice that the four bodies had spent the night elsewhere, while hospital patients were not to suspect that they were sharing state-of-the-art medical resources with humans who had lived more than 2,000 years ago. Now, two years later, the museum has released the results of that examination. 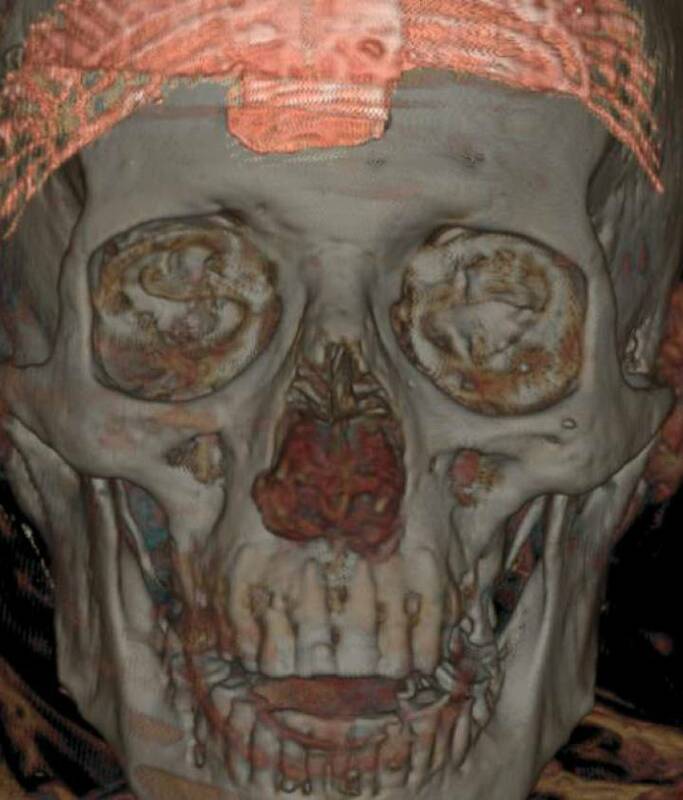 And it turns out that one of the mummies, which was covered in jewels and charms beneath its bandages, was the priest Nespamedu, the personal eye doctor of Pharaoh Ptolemy II, and perhaps also Ptolemy III (the jury is still out on this latter claim). His Spanish odyssey began in 1925, when the steamship C. López y López docked in the port of Barcelona with an unusual cargo: a mummy that had been bought in Cairo by the scholar Ignacio Bauer with scarcely any documentation, according to a report by Esther Pons Mellado, a specialist at the National Archaeology Museum. In fact, at first it was thought to be the body of a woman. Thanks to the tomography analysis, it has now been established that Nespamedu was a priest who lived between 300 BC and 200 BC and who worked at the Imhotep- Asclepius clinic in Serapeum of Saqqara (Memphis) or else in Alexandria as well as being doctor to the king, according to another report by archaeologists María del Carmen Pérez Die and Dr Javier Carrascoso. The information gleaned from the scan reveals that Nespamedu was a high-ranking official with enough money to have his body prepared for the journey to the afterlife. But according to experts, it is the charms and plaques stored within his bandages that are the most revealing. Two groups of eight plaques have shown up on different parts of the mummy in which the four sons of the deity Horus are represented. Another two plaques feature the goddesses Isis and Nephthys, while representations of the mummification of the corpse together with the god Anubis were found at the top of Nespamedu’s legs. The mummies are closely monitored, conserved behind glass with air-renewal systems and tightly controlled temperature, humidity and light levels. 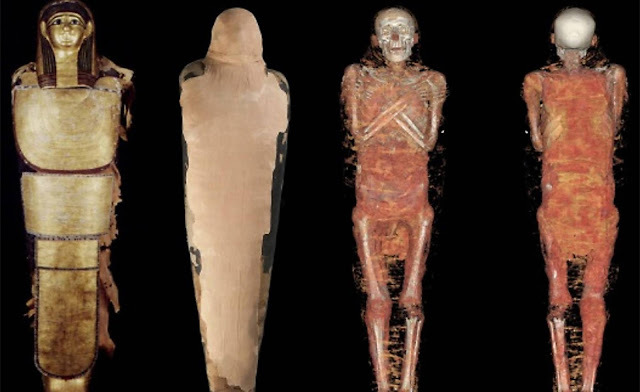 Such is the fragility of the mummies that the expert Teresa Gómez Espinosa notes how a highly specialized transportation company was chosen to transfer the bodies to the hospital for the scans. Two alternative routes were planned in case of unforeseen circumstances, and the trip took place on a night when the air was dry and the temperature mild. If there had been rain or an increase in humidity levels, the operation would have been called off immediately. After arriving at the hospital, Nespamedu and the other mummies were carefully introduced into the CT scanner. Nespamedu had 2,739 images taken of his body, which was virtually undressed, allowing the charms and plaques to show up. The headband he was wearing was a winged Scarab charm with a solar disc that also featured the god Khepri, symbol of resurrection and rebirth. Nespamedu also wore a Usekh collar, particular to the Egyptian elite – one of the most typical pieces of Egyptian jewellery, which normally features a falcon’s head and is supported by the shoulders with a counterweight on the back. It is known that priests and doctors were trained in the temple where Nespamedu attended to patients. In fact, a chapel dedicated to health was built In Imhotep’s honour and people came there from the most remote regions of Egypt in search of miracle cures. Its god was Thoth, deity of science and medicine, the forefather of ophthalmologists.